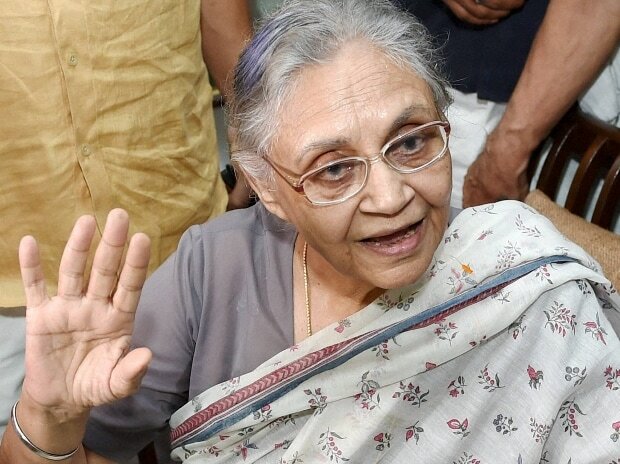 The Congress will not have an alliance with AAP and contest alone in Delhi in the coming Lok Sabha election, its state unit chief Sheila Dikshit said Tuesday. "We have unanimously decided that we will not have an alliance with the Aam Aadmi Party and we will contest alone and will emerge stronger," Dikshit told reporters after a meeting of Delhi Congress leaders with party president Rahul Gandhi. She said Gandhi has agreed to the decision against allying with AAP for Lok Sabha polls due by May. "So, we will go all by ourselves in Lok Sabha polls and there will certainly be no cooperation with AAP," Dikshit stressed. Party sources said Gandhi told Congress leaders during a two-hour meeting he would go by the majority decision and give preference to strengthen the organisation. Gandhi told them if Congress has to fight alone, he was ready and would not be cowed down by anyone, they said. Gandhi then asked for everyone's opinion and the majority favoured no tie-up with AAP, the sources said. Dikshit said work is going on for selection of candidates and sources said that a meeting of the party's screening committee would be held in a day or two to decide the candidates. The AAP has declared candidates on six of the seven Lok Sabha seats in Delhi. Shortly after the announcement, Delhi Chief Minister and AAP convener Arvind Kejriwal accused the Congress of having a "secret understanding" with the BJP and described it as an "unholy alliance". "At a time when the whole country wants to defeat Modi-Shah duo, Congress is helping BJP by splitting anti-BJP vote. Rumours are that Congress has some secret understanding with BJP. Delhi is ready to fight against Congress-BJP alliance. People will defeat this unholy alliance," he tweeted. AAP leader and Delhi minister Gopal Rai accused the Congress of "unofficially helping" the BJP in Delhi and in some other states. He said when the country wants the opposition to field a single candidate against the BJP "the Congress's final decision indicates it is unofficially helping the BJP". "Going by the action of the Congress, it seems it has an unofficial alliance with BJP. "Congress has been speaking the language of BJP for some time. AAP feels the way the BJP has helped the Congress win in Punjab, the Congress is unofficially helping the BJP win Delhi now," Rai said at a press conference. Gandhi's two-hour meeting with top Delhi Congress leaders was held at his residence. Ten Congress leaders led by Delhi unit chief Sheila Dikshit met Gandhi and conveyed their majority decision of "no alliance with AAP” to him. Among those present during the meeting were AICC general secretary in-charge of Delhi P C Chacko, AICC secretary Kuljit Singh Nagra and Delhi unit working presidents Haroon Yusuf and Rajesh Lilothia, besides five former presidents of Delhi Congress — Dikshit, Ajay Maken, JP Aggarwal, Arvinder Singh Lovely, Subhash Chopra, and former Speaker Yoganand Shastry. Dikshit said Congress will try to win all seven Lok Sabha seats in Delhi and the decision has been taken keeping in view the party's interests. She said the aim of every leader and worker is to strengthen the party, especially when the assembly elections were due in a few months. Incidently, Chacko and Maken favoured alliance to defeat BJP, but a majority of leaders were against it. They said Kejriwal was an "unreliable ally" and "a bigger enemy" of the party and the Congress must focus on upcoming assembly elections in the state slated later this year. The decision is being viewed as a "setback" to the opposition unity ahead of Lok Sabha election, as opposition leaders are seeking strategic alliances in states to unitedly defeat the BJP by ensuring that there is no division of anti-BJP votes. Chacko, the sources said, told the meeting that he was in favour of an alliance to defeat the BJP and by not having an alliance, there would be division of votes and BJP would benefit from it. However, most state leaders felt that the Congress must go alone to survive and win the upcoming state assembly polls. The AAP had suggested a formula of three seats each for AAP and Congress and leaving one seat for an independent candidate, which sources say was Yashwant Sinha.